The project aims at saving from destruction over 60 wooden churches of religious and symbolic importance in rural life, but also of notable social, educational and artistic values. Graceful and modest, mostly the size of a village house, the churches have a privileged location in the landscape outline. The elements of national, rural and religious identity that they display, amplified by the historical context that marked the border between Transylvania and Oltenia, comes from the same ethnicity, social status, economic level and occupation. Most of them were built in the 18th-19th centuries, raised directly by the local communities and rebuilt several times on the same site by craftsmen. They are the southernmost example of the wooden architecture of Central and Northern Europe. During the 20th century, as a sign of economic development of rural areas, there was the tendency of replacing the wood with stone, fact that exposed the wooden churches to neglect and decay. This phenomenon was accentuated during the communist regime. At present some 80% of these churches are abandoned, and some became cemetery chapels. These sacred buildings are also threatened by inadequate conservation. Since the churches were built by villagers, using the structures, materials and techniques of their own houses, they are simple volumes dominated by high roofs, with narthex, nave and altar. 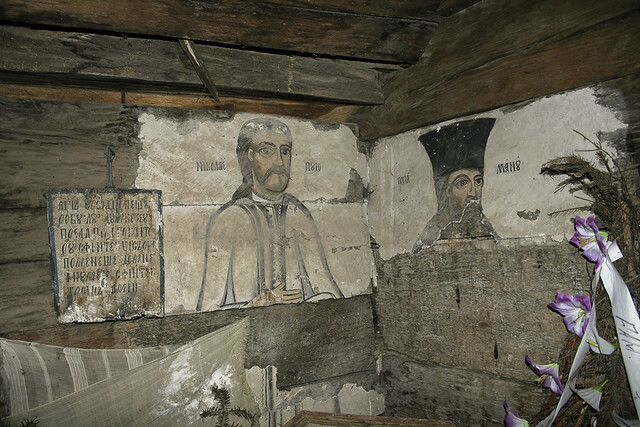 The interior is covered with paintings on wood or lime plastering al fresco. The exterior of some churches in Oltenia is also decorated. In addition to their notable artistic value, the paintings also tell the stories of the villages, their way of life, local characters, arts and crafts. The local community has made major efforts to rehabilitate and reuse these religious buildings but they have to be backed at national and European levels. The benefits of a coherent restoration process include: revival of old crafts, materials and building techniques, together with training of young people; and strengthening of the sense of community, local people participating in large numbers in the restoration process, providing materials, offering assistance and even creating local artifacts for sale in support of the project. This could open the way in the future for local itineraries across these villages, stimulating also traditional hospitality. The Pro Patrimonio Foundation nominated the wooden churches for ‘The 7 Most Endangered’ 2014.